Skin (head): Moderate multifocal to coalescing hyperplasia with hyperkeratosis and ulceration. 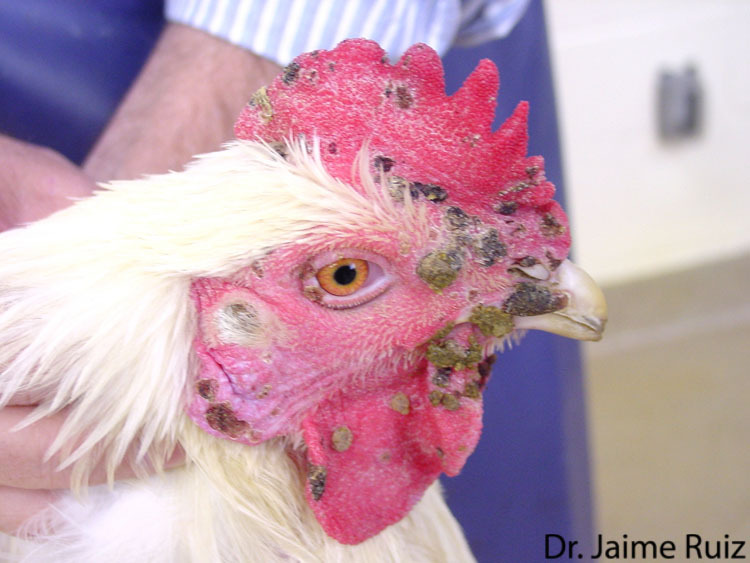 In the later stages of the dry form of Avian Pox, shown here, the cutaneous lesions on the wattles and comb have progressed into vesicles, exhibiting thick, rough, brown scabs. Some of the lesions have coalesced. The unfeathered skin of the head is covered by numerous, randomly arranged, well-demarcated, slightly raised plaques of brown, rough tissue. In areas, these plaques coalesce to form large lesions. A few of the plaques are covered by scabs.